I never thought I should be sharing a palak paneer recipe on my blogs. It was too ordinary everyday recipe that I thought everyone would know. After all you don't need any special skill to make palak paneer, that is what I thought. And then someone asked me whether I have palak paneer recipe on the blog when I suggested it in her meal plan. I realised such regional recipes have become popular because of their popularity in restaurants and people relate these recipes with heavy and rich curries they eat at those restaurants. The simpler homely deliciousness of palak paneer and such recipes stays limited only in their respective regions. That was enough reason for me to think about posting some of the very ordinary but popular recipes so whoever wants to try the homely version of palak paneer gets a chance to taste the original flavour. Although the original or authentic taste may be an illusion as every family has it's own recipe, my intention is to get the unspoiled taste of spinach and paneer in the curry. Also, as I learn more about the complex recipes I realise we need to have exact and accurate recipes of the simpler food too as a simpler recipe is more likely to get lost for the lack of seriousness attached to it. If we know the simpler version we can always add on our own twist to it according to seasons and taste. Like I make a palak paneer tahiri sometimes with leftover palak paneer or add some sweet corn kernels to the plain palak paneer to make it more interesting. Note that palak paneer can be made in a jiffy if the palak (spinach) has been cleaned, rinsed, chopped and steamed already. This is the way I store my spinach mostly. Once the greens are chopped and lightly steamed, it refrigerates well for 3-4 days and freezes well for months. I keep it in a container for 3-4 days. Alternately, cleaned unwashed spinach also keeps well for a week, if wrapped in brown paper or cloth napkin. Just rinse, chop and use as required. 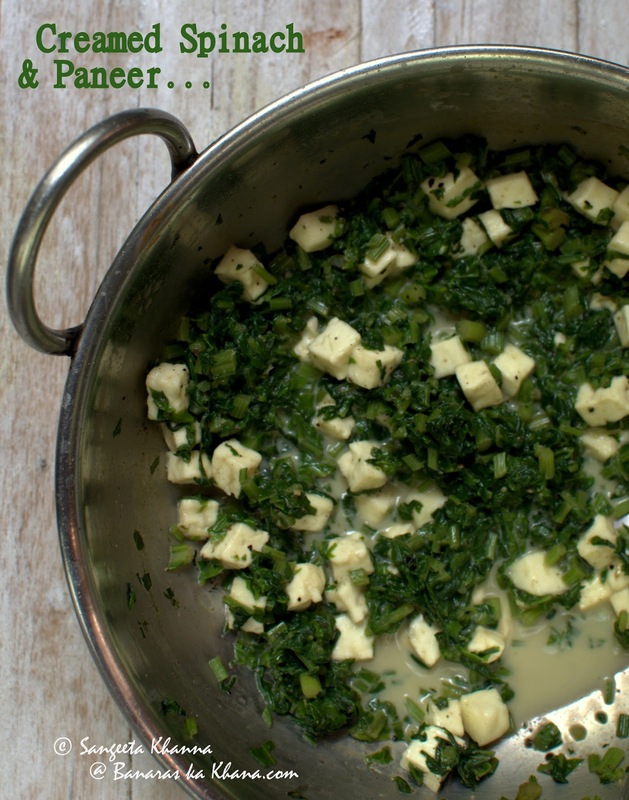 My simplest palak paneer recipe has been the most popular with any guests and even kids. Even my daughter used to love the simpler version of palak paneer. So the first recipe is the plain palak paneer that gets ready in just about 10 minutes if you have the steamed spinach ready in the fridge. 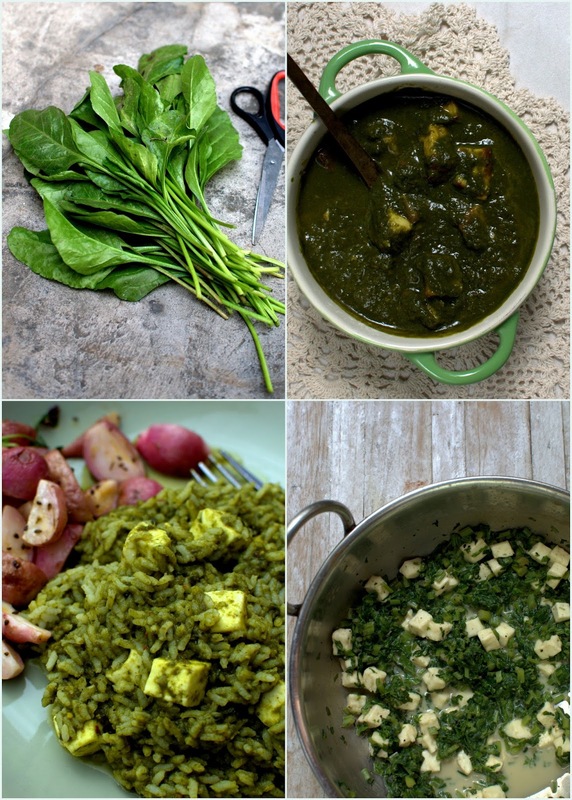 Note that you can use the stems of spinach too for palak paneer if the leaves are tender, but if the spinach leaves are mature and the stems are hard, it is better to remove the stems as it may make the curry slightly bitter. Puree the spinach and keep ready. Heat the ghee lightly and tip in the cumin powder. Pour the spinach puree as soon as the cumin powder starts sizzling. Take care not to burn the cumin powder. Stir and cook till spinach puree starts bubbling. Add the other ingredients and simmer for 2-3 minutes. Serve right away. This recipe is a fasting recipe that we used to eat during navratri a lot. You can have it with plain boiled buckwheat groats or sama ke chawal too. This recipe takes about 15 minutes if you have the chopped and steamed spinach ready. 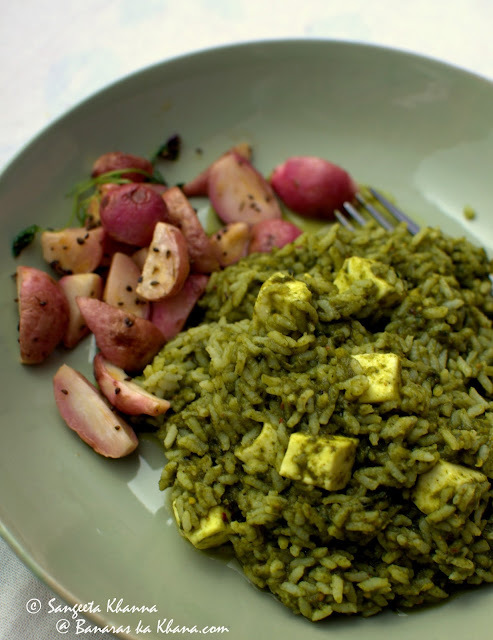 This is more close to the restaurant style palak paneer but way more healthier homely version of it. Grease a griddle ( I use my cast iron dosa tawa mostly) with ghee or oil and grill the paneer cubes both sides till lightly browned. This step is optional but enhances the flavour, you can deep fry the paneer if you are making large quantity. Dip all the fried paneer cubes in a cup of hot water, cover and let it rest till required. Puree the spinach and keep aside. Heat mustard oil and tip in the finely chopped onion and fry till golden brown. Add the ginger garlic paste and salt, fry till oil releases. Add the powder spices with a tbsp of water and bhuno on medium flame till it looks glazed. Add the tomato paste and bhuno again till it dries up. Add the spinach puree and let it bubble once. Add the fried paneer cubes along with the soaking water, simmer for a couple of minutes. Serve hot. This version of palak paneer lends well to palak paneer wali tahiri. I usually make some extra rice and refrigerate the leftover. This way we can make a quick meal with leftover things. For a cup of cooked rice you can use up 1.5-2 cups of leftover palak paneer, just mix both the rice and palak paneer well and let it cook covered on very low flame for 10 minutes or so. In our case it is usually half the quantity and I cook it till it start looking like this. I usually make a quick stir fry with this kind of meal too. Here it is a radish stir fry we love a lot. Will share the radish stir fry recipe soon. 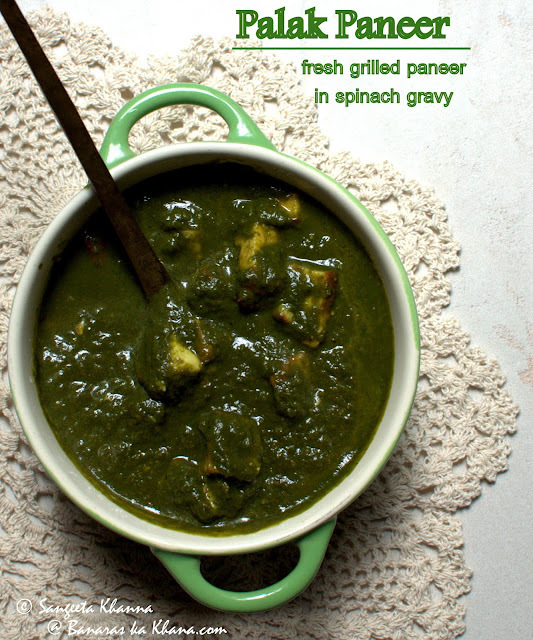 Another palak paneer version is my way of making creamed spinach mostly. 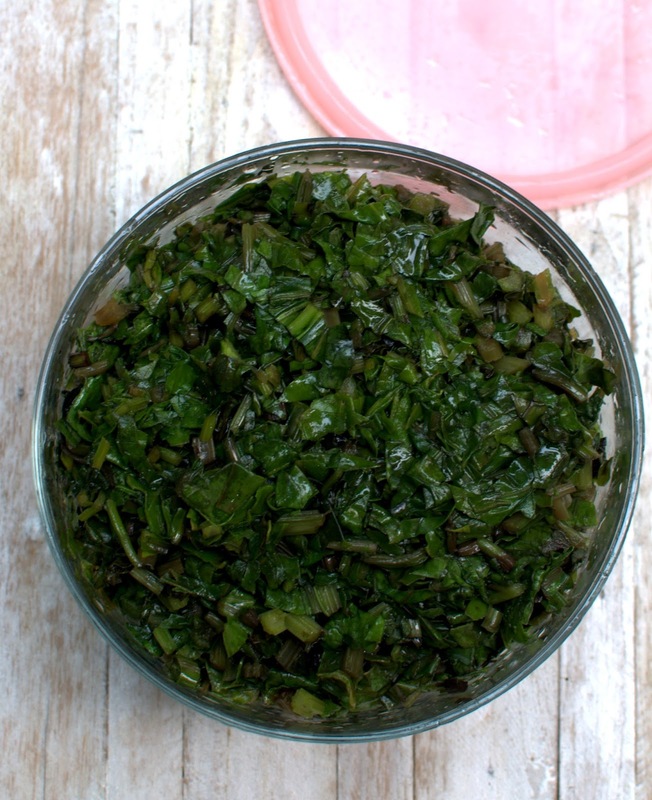 It is a practical way to eat greens and make it workable for a roti subzi kind of Indian meal too. Basically everything can be put in a pan and cooked till the spinach wilts and the cream get a greenish hue if you go by what I do. But wilting the spinach forst with added salt and then adding everything else and cooking it all covered for a few minutes does the trick. That's all. The 'curry' style creamed spinach and paneer is so convenient for me sometimes it saves me on hectic mornings. We have had it with plain boiled rice, roti, paratha and even with plain boiled pasta. Try it once and you would know what I am talking about. Hoping that making palak paneer will not be difficult any more,e if you have palak paneer in restaurants all your life. Try making these versions and tell me which one you liked more. Each one has a different flavour and you would plan these with different kind of meals once you start making them in your own kitchen. The home made paneer could be of great help if you wish to keep the fat content of paneer in check.